Come on, stop trying to hit me and hit me! Do you ever get the feeling we are living in a simulation? 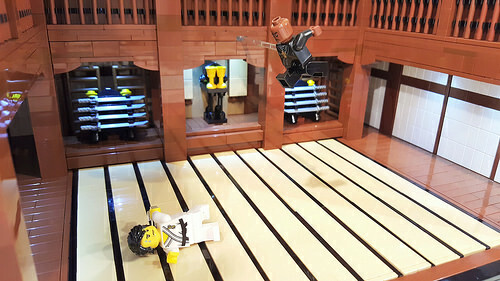 One of the greatest cinema moments of the nineties has been brought to life in LEGO by Douglas Hughes in this scene from The Matrix where Neo asks, puzzled, “I know Kung Fu?” Morpheus looks at him quizzically and challenges, “Show me.” Douglas has captured the simple complexity of the dojo beautifully, adding special lighting for the sword racks. With its stark lines and contrasting colours, Neo deftly dodges one of Morpheus’s relentless attacks.